Muse n. The source of an artist’s inspiration. In Greek and Roman mythology nine sister goddesses, the daughters of Zeus and Mnemosyne were muses who presided over the arts and sciences. Muse v. To think or meditate on a subject thoroughly and thoughtfully. Ponder, contemplate, ruminate. I am a UK artist and have worked professionally as an illustrator and fine artist. Batik has been my chosen medium for over thirty years, but I am regularly inspired by other mediums and art forms. Working in three dimensions is an exciting and challenging new route to explore the themes I love. Creating art muses are proving to be a satisfying way to combine my love of art, portraiture, symbolism and textiles. Each muse is an intricately detailed artwork, a collectible, not a toy. Information about the artist and life stories of each muse will be recorded in detail on my blog, which I hope you’ll find interesting. Followers are welcome and comments are sincerely appreciated. Looking at paintings I am often drawn to the female subjects, the muses or models who imbue the artwork with their persona, and I wonder at how important they are in expressing the ideas of the painter; or is the artist imposing his story and ‘modelling’ her in his colours, his ideas? I think the relationship probably works in two ways, the model inspires the artist and becomes his muse: and she is then portrayed in ways that tell his or her story. This can be seen especially in the works of Rossetti of the Pre-Raphaelites, also Burne- Jones, Botticelli, Modigliani, Mucha and Klimt as well as many others. Art, sewing and doll-making have been interests of mine since childhood, when at seven years old I was given my first Singer sewing machine. At the time my mum was teaching fashion at St Martins School of Art and I was given off -cuts and scraps of fabric, always in dazzling colours and modern prints. I delighted in creating all types of dolls, clowns, and animals with my continuous supply of cottons, felts and slinky fabrics. As a teenager I was making rag dolls to commission, alongside drawing portraits, enabling me to earn my own money. After my degree at Goldsmiths I worked as an illustrator, choosing batik as my medium. My enjoyment of fabrics continued in dressmaking and soft sculpture and is now finding a new direction in my art muses. Combining my interest in art with my love of doll construction and dress making seems a natural progression. The process of studying artists and their work is really enjoyable research and allows me the pleasure of examining some of my favourite painters and their paintings in detail. ‘Love Among The Ruins’ detail by Edward Burne-Jones. Modigliani’s Portrait of Jeanne Hébuterne. 1916- 17. “Penelope and the Suitors”, J.W. Waterhouse 1912. The Girl With The Pearl Earring, painted in oil by Johannes Vermeer c 1665. La Musique, Henri Matisse, 1939. These musicians inspired the face of my Matisse muse. Portrait of Lizzie Siddal, by Rossetti, 1860. Wally detail from ‘Woman in orange stockings’. Femme avec Livre 1932, a portrait of Marie-Thérèse, by Picasso. Her profile can be seen in the mirror behind her. Portrait of Dora Maar, 1938, by Pablo Picasso. This was one of the paintings that inspired my muse of Dora Maar. Mona Lisa detail, from a painting by Leonardo da Vinci. Frida self portrait with thorn necklace, 1940. 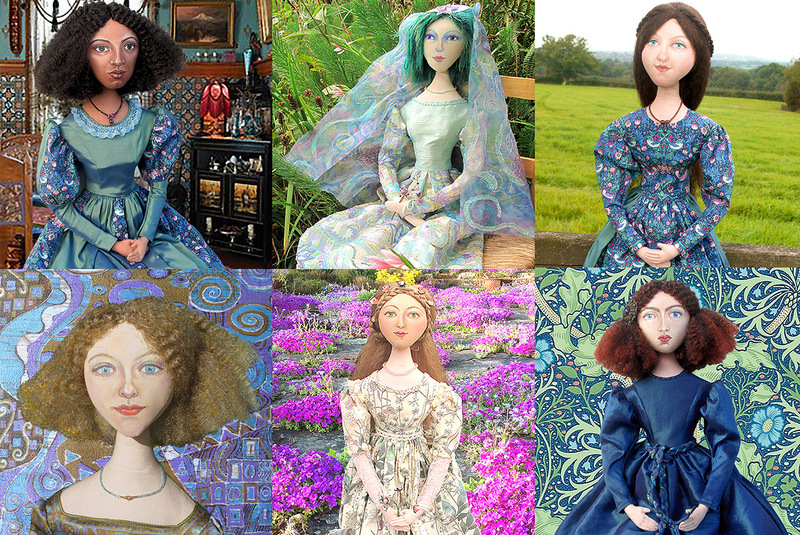 The first six muses: Fanny Eaton, Chagall Bride, Effie Gray, Emilie Floge, Primavera and Jane Morris, muse creations by Marina Elphick. Followers are welcome and comments are sincerely appreciated, so please feel free to write in the box at the very bottom of the blog pages. (unfortunately not this page).